Amata Ngapali Beach Resort, stretchs along shoreline of Ngapali Beach Myanmar. 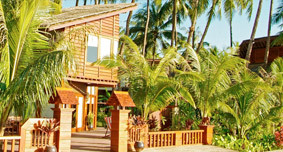 Myanmar most exclusive Ngapali Beach resort hotel stretches along the beautiful shoreline of Ngapali, which is a very pleasant beach resort natural and unspoilt – a place for peace and tranquility. Ngapali Beach is one of the famous land for resort & The Amata Resort is a one of its kind resort located near the delightful Mya Pyin Village at Ngapali Beach, Myanmar.